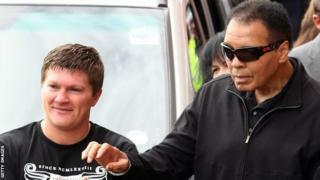 bbc.com"There were people all the way down the street," recalls Ricky Hatton. "I'm massively proud of my Hyde roots and that day the town was in the presence of greatness. "The date was 26 August 2009. A crowd, several hundred strong, had gathered under rainclouds to await the arrival of a silver people carrier.Cheers greeted the vehicle as it pulled up on Market Street and an entourage stepped out, followed by a frail looking 67-year-old wearing dark glasses. Three-time heavyweight world boxing champion Muhammad Ali - one of the world's greatest sporting figures - was in Hyde, a few miles east of Manchester, to meet local hero Hatton and open his gym. There has been little of sporting significance for the town to shout about in the eight years since. But that could change on Friday as a televised FA Cup tie captures the imagination of locals - including Hatton, the former world boxing champion nicknamed 'The Hitman'. It may not be the stardust of Ali, who died last year at the age of 74. Instead, it is the opportunity to cause the first big upset of this season's FA Cup. Eighth-tier Hyde United - average league crowd 328 - host MK Dons in the first round, live on BBC Two, before a 3,500 sell-out crowd. "It's great to see them in the first round at home to a League One club on TV," Hatton told BBC Sport. "When Muhammad Ali's people said he would be coming to open my gym, my jaw hit the floor," said Hatton of his meeting with one of the world's greatest sporting figures"I know they've struggled recently but this is terrific for the area and I wish them all the best. "Hatton's first football love is Manchester City, for whom he played as a schoolboy alongside brothers Jim and Jeff Whitley, who went on to make more than 150 league appearances for the club between them. "I was certainly on their level at that time," added The Hitman, who used to walk to the ring to City's anthem 'Blue Moon' and regularly wore sky blue shorts in reference of his support for the club. bbc.com"I've often wondered what might have been had I stuck with football but I won one or two amateur boxing titles and I was getting a reputation. No-one wanted to fight me. My attendance at football dropped. "Work commitments have restricted Hatton, 39, to just three City games this season but, if his diary allows, he hopes to make an appearance at Ewen Fields, Hyde's home, for the Northern Premier League Division One North club's biggest game in years.Moors murderers Ian Brady and Myra Hindley. Just down the road, doctor Harold Shipman became notorious as Britain's worst serial killer. "This area hasn't had many things to shout about," said Hatton, who lives in Gee Cross, a short car ride from his £2m gym in Hyde, which employs 25 people. "I hope during my boxing career I was able to make people round here proud and it's great people are now talking about Hyde United. Ricky Hatton met Sven-Goran Eriksson when the Swede was manager of Manchester City"I could live anywhere but I've never lived outside a five-mile radius of Hyde. It's a working-class area full of hard-working people. "When Muhammad Ali's people said he would be coming to open my gym, my jaw hit the floor. They cordoned the road off and people were stood outside waiting to catch a glimpse of him. "There's a picture of us embracing. It takes pride of place in my games room. I'll never forget that day." Hatton's beloved City have recently had strong links to Hyde, nicknamed the Tigers.The Etihad Stadium is eight miles from Ewen Fields and while City's £200m academy - which opened at the end of 2014 - was being built, the Premier League club entered into a groundshare arrangement with their neighbours for reserve, under-21 and academy matches. As part of the deal, the non-league club temporarily dropped United from their name while Ewen Fields was turned from Hyde red to City blue. Then: How Ewen Fields looked before Hyde United entered into a partnership with Manchester CityAlthough the arrangement has ended - the Tigers were given permission to change the club's name back to Hyde United[/i] in 2015 - the ground remains predominantly blue as the Tigers have not had the finances to re-paint the ground red.That is likely to change thanks to this FA Cup run. While this is MK Dons' first game in this season's competition, the Tigers are preparing for their seventh match after starting on 19 August with a 4-2 preliminary round home win over Congleton Town in front of 332 fans.Darren Kelly's side have earned £29,425 in prize money for battling through five qualifying rounds, while the club are expected to earn an additional £100,000 in TV revenue, sponsorship and gate receipts for this game. Now: Hyde hope to paint Ewen Fields back to red with proceeds from their FA Cup run"City paid for the makeover, it was part of the deal when they rented the ground from the club. They wanted to put their livery on it," explained Hyde's community general manager Pete Ainger. "The deal ended a while ago and we feel we have moved on. Ultimately, we'd like to get back to red but it takes time and finance. It's about getting our identity back. "Hyde also plan to use proceeds from the cup run to replace a tea bar destroyed in an arson attack[/i] three years ago. The Tigers can claim to have had England cricket and football internationals on the books - as well as a Liverpool-born comedian.Before he hit the big time, John Bishop[/i] played in central midfield for a number of non-league clubs, including Hyde, and came close to walking out at Wembley for the Tigers.He appeared in both legs as they reached the semi-final of the FA Trophy in 1989, losing 4-0 on aggregate to eventual winners Telford. John Bishop (back row, third left) is pictured in a Hyde United team photoBishop made his first appearance for the Tigers on 26 November, 1988, and went on to play for the club 57 times, scoring seven goals. His last appearance for them was 5 February, 1990.The comedian has not forgotten his former club despite his rise to fame.In 2009, he responded to a request for help when Hyde were in financial difficulty and were served with a winding-up order, which was overturned at the High Court.Bishop donated tickets for his shows to a raffle to raise funds for the Tigers. William Chatterton, who appeared in Hyde's earliest days, played cricket for the MCC against South Africa in Cape Town in 1892. Defender Ephraim Longworth captained England in a 2-0 win over Belgium in Brussels in 1921 - 14 years after leaving Hyde.More recently, England World Cup winner Sir Geoff Hurst accepted an invitation to become club president at Hyde. England World Cup hero Sir Geoff Hurst was presented with a Hyde United shirt by Tigers boss Darren Kelly when he visited Ewen Fields in JulyHurst, who scored a hat-trick as England beat Germany 4-2 in the 1966 final, was born in nearby Ashton-under-Lyne and then lived in Denton before his family moved to Essex when he was eight.That is not the only connection that he has with the club - his father, Charles, was once on the books at Hyde. In a town with such sporting history, Hyde United's task is to add another chapter on Friday - and make the locals proud.